If you already know who Sheikh Akbar is and you want to know why he left TrueStory ASA then you can watch video number 3 and 7 on this page to hear what he says. And if you don't know about him then let me tell you. He is a US born YouTuber, he made lot of videos with his 'friend' Adam Saleh and they had lot of subscribers and they were quite popular all over the world until May 11, 2015 they got split up for some reason no one really knows why. Well, it seems like some people are still wanting to know what happen to True story ASA. If you are one of Sheikh's fan then shame on you. Shame on you all Bangalis who are fans of other than your own kind. Have you ever seen Pakistanis following Bangalis? Keep dreaming that they are your brothers and sisters until you wake up and find out it was just a dream, and your own kind gone too far you can't even see. At that time no one will come to help you out. Forget Fake story ASA his (Sheikh's) own channel is all most dead. He probably got disappointed and slowly stopped uploading videos. On the other hand the cheater got everything because of his looks and all. Go on girls, go after the looks and money and be gold diggers. And don't cry when people like (Adam) dumping you, because you people deserve that. Video 1 SPLITTING UP! Published on May 11, 2015 : Let's see what they say. He elevated the friendship to a brotherhood, a brother who never hang around with his brother. He can and will do anything for him, yet he can't even shout out in his video for him. Forget shout out he doesn't even link his (Sheikh's) channel to 'his' channel. At the same time he is promoting his new friend's (Slim) channel right, left and center and link his (Slim's) chennel where ever possible. And of course you will find many more things that he said but he never did. Who knows this could be his (Sheikh's) last and final time to get big time bullied. It is the moment of truth. Did you know that there was huge effort of Sheikh to grow this chennel? At least he (Adam) could have invited him to this special day, or at least mention his (Sheikh's) name in the video. I feel sorry for Adam's brain washed robots (subscribers). Well, at least some people are rising up and started looking for the answers. Here are some of the keywords that people are searching for. why true story asa split up? why is adam saleh not friends with sheikh? 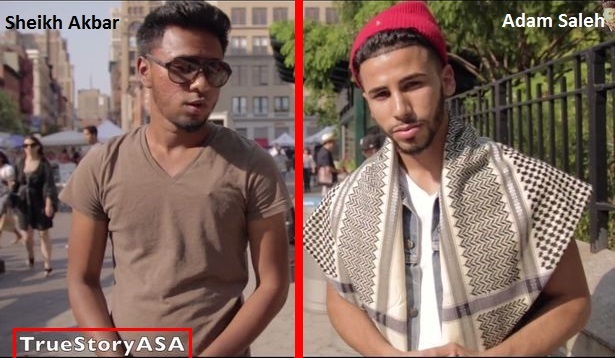 why did sheikh akbar and adam saleh split? why did adam saleh and sheikh akbar split up? why did adam and sheikh split? why aren't adam and sheikh friends? why adam and sheikh split? are adam saleh and sheikh akbar friends? If you are one of those who worship Adam Saleh (sorry I had to say this because some people are so mad that it seems like they will do anything for him) you will never hear the answer from him, and if you do please do tell us in the comments below. One thing I really don't understand is that, if the 3MH drama's solved then why don't Adam and Slim never do video with Sheikh? That shows there is something still going on. The reality came out at last. Wow. Adam really hurt Sheikh. I used to like Adam but now I don't know what to think about him. Don't worry, Sheikh. ❤ Adam wasn't your real friend. Brother I am a Bangladeshi American from New York like Sheikh. Ethnicity has nothing to do with Sheikh breakup from Adam. Couple months back Sheikh made some videos with some Arab Australian brothers and his new friend Abdul is Pakistani. Especially in New York people of all nationalities get along. So to sit here and say it's a Bangladeshi vs Arab thing is absurd because if you do research it was a Bangladeshi Londoner who happens to be Sylheti caused the breakup between Sheikh and Adam. Sadly it was a Bangladeshi brother that ruined their relationship. What are you going to say now Sylhet vs Noakhali is the blame. Let's get away from blaming other ethnicities it is the individual who is a snake. I understand that's Sheikh channel is dead, but there's probably a reason behind that. I've watched this video he posted about a few months ago (https://youtu.be/wQOp4R0i33o). And in the video he did get disappointed about his career so you were right. But there are a few other reasons why he decided to take a break off of YouTube for a while so let me list of few reasons he had mentioned. 1) He explained that he decided to take a break off of social media just to hang around with his friends and family while having fun. 2) He got a job at the airport because of his parents wanting him to focus on looking for a job that he'll take. Look on the bright side, at least Adam gets karma every once in a while for what he did to Sheikh. OMG, THAT DIDN'T HAPPEN LIKE WTF. AND WHO THE FU*K IS SHEIKH AKBAR??? ?